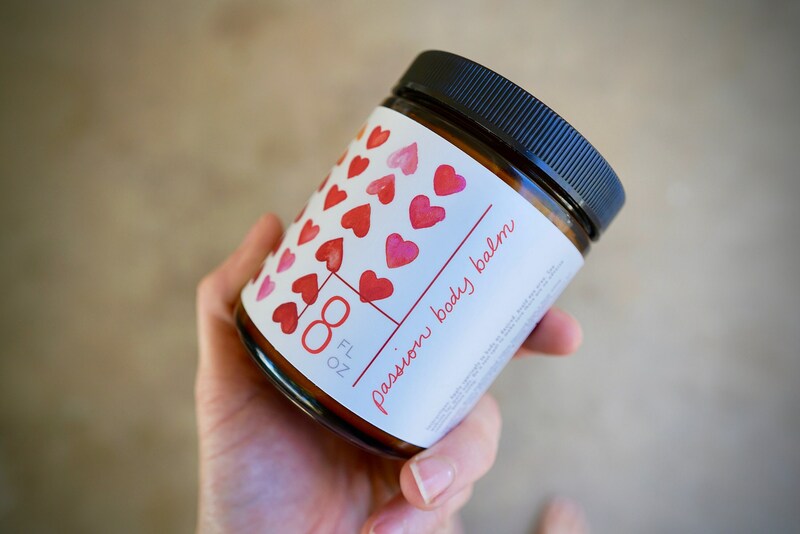 We have only made a small batch of 45 Passion Body Balms this year. Last year we sold out quick, grab your's before they are gone! Spicy & sweet... 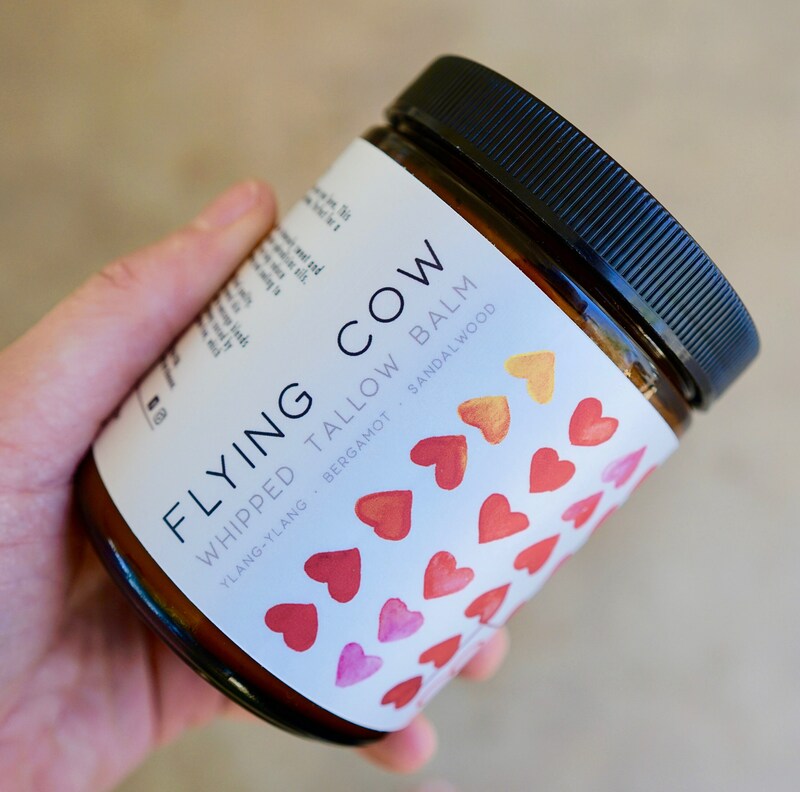 Flying Cow's Passion Body Balm is perfect for the one you love! This handcrafted blend is rich and wears like a lush perfume. Perfect for a romantic massage. The smell is a mix between Clinique Happy and Est’ee Lauder’s Beyond Paradise! Rub on arms and legs and breath in the luxury. -Ylang-Ylang: Oil from the Ylang-Ylang Bloom. Intensely sweet, floral scent. 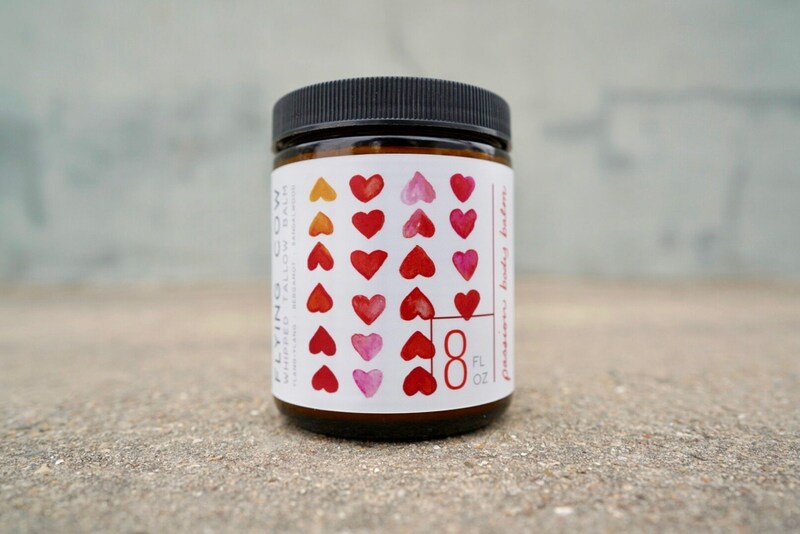 One of the most popular aphrodisiac oils. -Sandalwood (Australian)- Sweet, woody, scent. It may help reduce oiliness and can be clarifying. It can also feel soothing and cooling to the skin. -Bergamot- Citrusy and fruity with a warm spicy floral quality. Bergamot is gentle for skin care and can help tackle skin problems and oily skin. It is also a favorite to add to massage blends to help reduce muscle tension and give relief from tightness caused by overexertion or achy muscles. Our bergamot is bergaptine free, which means it is safe for use in the sun. INGREDIENTS: Grass Fed/Finished Tallow (Sourced from a farm using organic practices. ); USDA Organic Ylang-Ylang; USDA Organic Sandalwood; USDA Organic Bergamot; Unprocessed, Organic Coconut Oil. Apply sparingly to body as desired. Avoid eye area. See website for more uses. Do a test spot to make sure there are no adverse reactions before using. Results do vary. These statements have not been evaluated by the FDA. This product is not intended to diagnose, treat, cure or prevent any disease. Keep your tallow light and fluffy by storing it in a dry cool place. There is no need to refrigerate but it will start to liquify if it gets too warm. We love wholesalers!!! If you are a brick and mortar store, we would love to set up an wholesaler account with you! Contact Britney Arceneaux 432-934-6118. 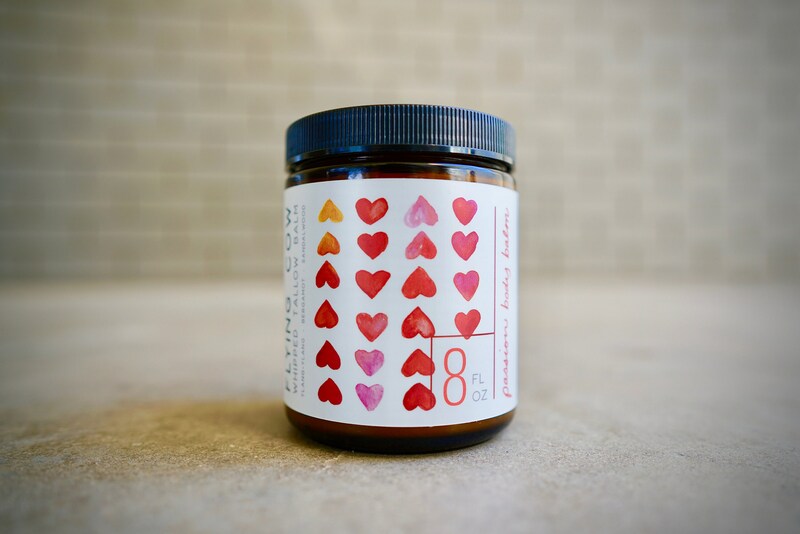 We currently offer 3oz, and 8 oz sizes. Will my Whipped Tallow feel greasy? Your skin will love tallow and it absorbs it easily! If it feels greasy, your probably using too much. Just cut back and the problem should resolve. As always, we want our customer happy, so if your not, just let us know and we would be happy to refund your money within two weeks of receiving your product. 1) Yes. 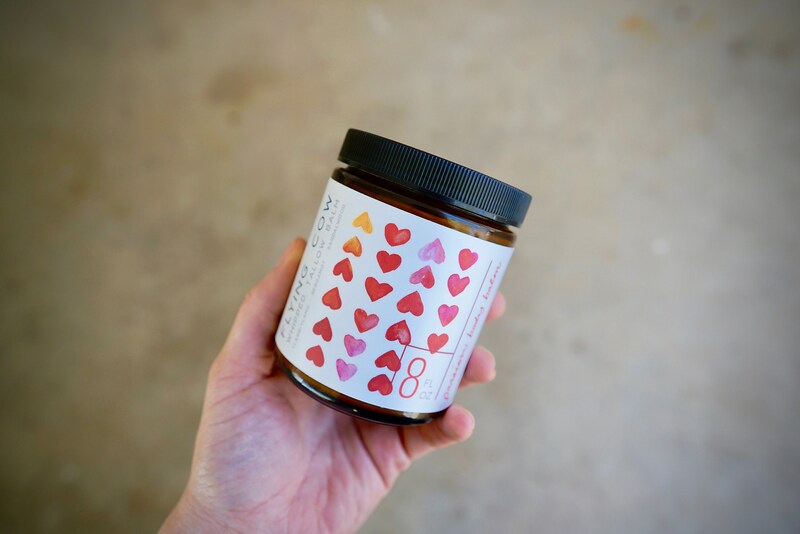 If you receive your jar and it is melted, please shoot us a picture and we would be happy to get you a replacement jar asap. 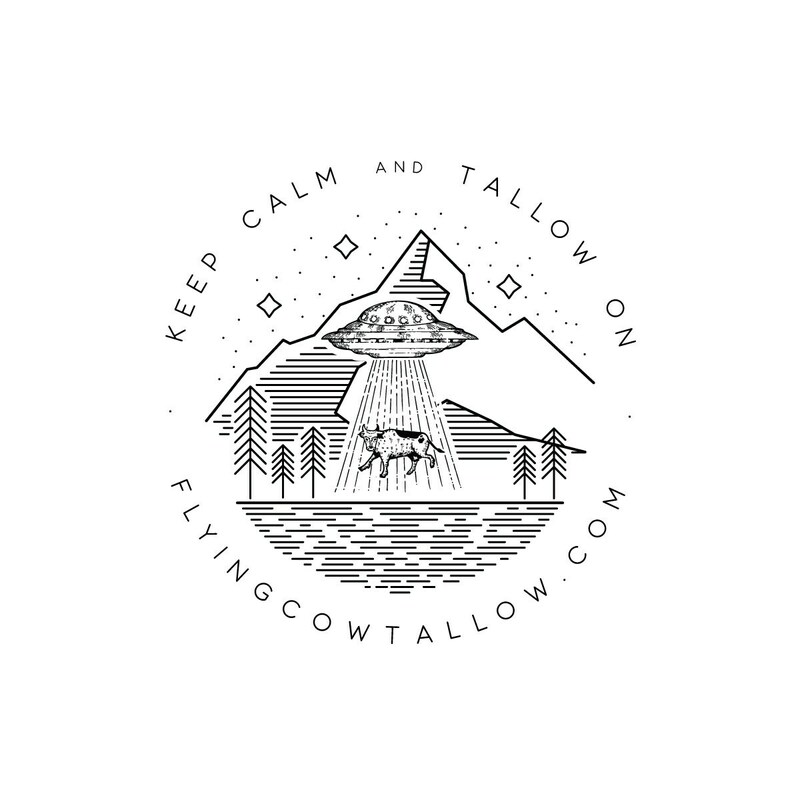 2) While we and our friends and family love tallow, we know there is always that one in a million that won't. That's just fine! We accept returns within two weeks of purchase. That should give you enough time to figure out what works for you. There are several ways to use our Whipped Tallow Balm. 1)You can use it as an oil cleanser for your face. 2) Facial moisturizer (eye cream, anti aging serum, acne treatment and prevention). 5) Babies! Diaper cream, moisturizer, chapped cheeks or noses, rashes, cradle cap, cuts or wounds). Use unscented for babies. 6) Sunburns or any wound healing. 7) Scar healing (Acne scars or stretch marks). 8) To help with skin elasticity (During pregnancy or before weight loss). And I'm sure there is more. This is just off the top of our heads. Just send me a message and I will give you the details. I will either resolve the issue or refund as soon as I can. I'm a cat herder full time (I have 5 little kiddos under 8 😝😍) so I try to check my shop in the evening/night hours. This stuff is amazing. Love the local pickup. I will forever be buying this.